Pretty Lights will be previewing material from the forthcoming album on the “The Illumination Tour,” which launches with two sold-out hometown shows at Red Rocks Amphitheatre in Morrison, CO on August 17 and 18. Tickets go on sale today for the remaining shows on the first leg of the headline run (August 23 – October 6) with the exception of Mobile, AL (on sale July 2) and San Francisco, CA (on sale July 13).“The Illumination Tour” will include stops at the legendary Shrine Auditorium in Los Angeles (9/15), Boston’s TD Garden (10/31) and Detroit’s Compuware Arena, where the outing wraps up on November 17. Pretty Lights will also be playing numerous festivals, including Electric Zoo in New York City on August 31, North Coast in Chicago on September 2 and CounterPoint in Atlanta on September 29. The tour will feature a wide range of support acts including DJ Shadow, 12thPlanet, araabMUZIK, Marty Party, Zion I, Big Gigantic, Lotus, and more plus PLM artists, Paul Basic and SuperVision. See below for full itinerary and support acts. Pretty Lights has given away more than 2.8 million free album downloads to date. 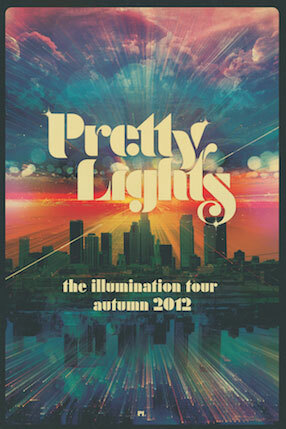 For more information on Pretty Lights and Pretty Lights Music (PLM) – the record label founded by Derek Vincent Smith – visit www.prettylightsmusic.com, where all PLM music can be downloaded for free.